I asked my wife today what the title of the blog post should be today and her response, well, you can tell by the post title! I will mount my defense however throughout the blog post and I will let you decide if the post title is apropos or not. Fair deal? I visited my surgeon for another appointment today. He was glad that he won the battle of whether I would be able to talk given the band configuration that he placed me in (he most definitely did win) but there was light at the end of the tunnel; he said that as my facial swelling has continued to go down he can now start banding my teeth in diagonal patterns which apparently must be a good thing? 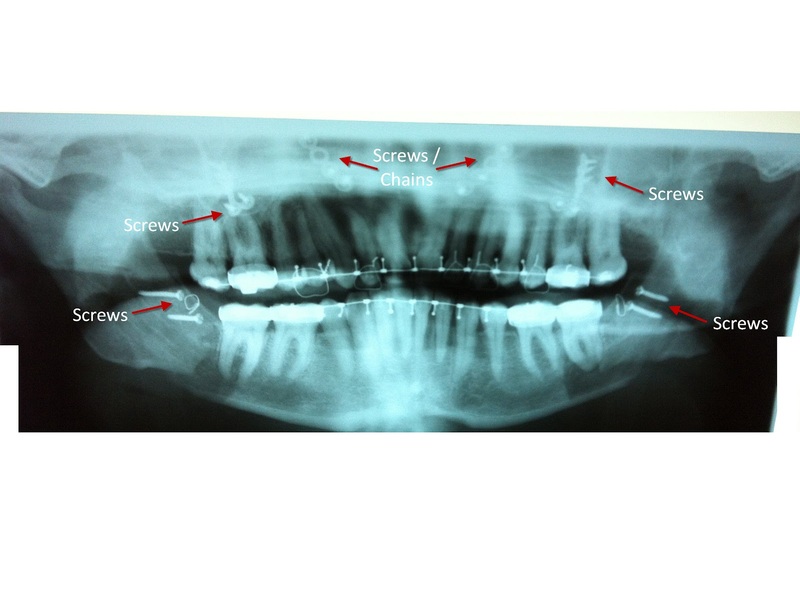 Anyway, he altered the configuration of the bands so that although I still have four (seemingly to me very small) bands on my teeth; two bands are in triangle patterns and two are simply go straight up and down. Straight up and down clearly reduce flexibility of motion while the triangle banding allow more flexibility. So, I can talk easier than the previous two days but that is not hard as I was a mute. I definitely feel a more pronounced pulling on my jaw joints given that the triangle designs are attached to the utmost back part of my teeth but oh well, exercising the jaw is something that needs to happen so that I can hopefully be able to open my mouth more and more! 1. From now until my next appointment, I can take the bands off for 60 minutes, 3 times a day. 2. Next week, I can take the bands off for 90 minutes, 3 times a day. 3. The third week, I can take the bands off for 120 minutes, 3 times a day. 4. The fourth week, I only have to wear the bands for 2 to 3 hours a day. There is hope then where talking is concerned as presently I sound like I have something wrong with me as I speak super slowly as I try to get the words to sound correctly and well, it just sounds odd. I also asked him about the pain in my jaw joints, especially in my left joint. It hurt a lot when I either talk or eat and he said that is completely normal given that the joint is now sitting perfectly aligned for the first time ever and it has to get used to it. Over time, the pain will subside. I had asked for a copy of my before and after X-rays which had been taken one week prior to surgery and one day after surgery. Very, very cool to see them! 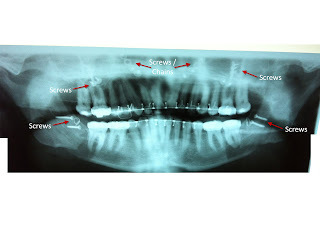 Hopefully you can make out the differences as well as see all of the screws, pins, chains, etc that are now a permanent part of my facial structure! Try opening the picture and then zooming if you have difficulty. It is absolutely amazing to me the see the difference between the two. 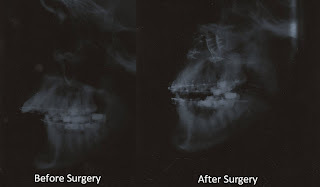 He moved my lower jaw 18mm (the average is 4-5mm) and then spaced my upper jaw 12mm as well as performing genioplasty on my chin to rectify issues as a result of the movement of the two jaws. For the first time in my life, my jaws are now aligned perfectly! Amazing what medicine is capable of isn't it!